You’ve had a persistent pain in your neck, back, or arm which may have been accompanied by numbness in your arms. Spinal fusion has been presented as an option to alleviate your pain, but it seems like a drastic measure. Is there an alternative that can help alleviate your pain? But before we take a look at some spinal fusion alternatives, let’s first talk through what could lead a person to seek this type of treatment. Any type of surgical procedure is typically the last resort when it comes to treating a medical condition and/or alleviating discomfort. That’s definitely true when it comes to treating spine-related pain, including both neck pain and lower back pain. This type of pain and discomfort can have a number of causes, including the most common degenerative disc disease, spinal stenosis, an infection, a tumor, scoliosis, kyphosis, or a fracture. In serious cases where pain isn’t alleviated by conservative treatments, spinal fusion has been an option for decades. This procedure essentially aims at fusing (like welding) together the spinal vertebrae that are causing pain, which then heal into a single bone. This is often combined with a procedure to relieve pressure off of a nerve. The process of fusion can take time and, in some cases, may take up to two years. Spinal fusion can sometimes be performed through minimally invasive methods which cause less insult to your muscles. However, in most cases, it is a significant surgical procedure, and may involve a lengthy recovery and have a risk of side effects. So, what are the alternatives? When a patient seeks care for either neck or lower back pain, doctors will typically recommend multiple nonsurgical treatments before resorting to a surgical procedure. The exact type of treatment will vary depending on the location of the pain. So determining the source of the pain is step one. For people experiencing lower back pain, therapy will focus on building the core, while for neck pain, therapy will work to improve neck strength and movement, and relieving stiffness. While conservative treatments are often enough to alleviate pain, in some cases, discomfort lingers and interferes with daily life. That’s when surgery is typically offered as an option. While spinal fusion is a treatment option for certain conditions of the spine, this isn’t the only option — there are spinal fusion alternatives available at Erlanger. Anterior cervical disc replacement — this procedure helps alleviate cervical neck or arm pain by removing the damaged spinal disc and replacing it with an artificial cervical disc. The advantage of this procedure when compared to a spinal fusion is that it preserves motion at the disc space, which allows a person to maintain more normal movement. Cervical laminoforaminotomy — this procedure helps alleviate pain shooting down the arm by relieving pressure on a compressed spinal nerve in the neck. During this procedure, a window of bone in the lamina (the wall of a spinal vertebra) and foramen (the portion of bone that encases the nerve) is removed to take pressure off the spinal nerves. Lumbar foraminotomy — this procedure helps alleviate leg pain by removing bone and tissue that compresses the spinal nerve. It helps enlarge the passageway where the spinal nerve exits the spinal canal. Lumbar discectomy — this procedure helps to alleviate leg pain by removing the herniated (leaked out) portion of the lumbar disc that pushes on a nerve causing the pain. Once the bone spur or other disc material that’s causing pain is removed, discomfort is typically lessened or eliminated. Is neck or lower back pain interfering with your quality of life? Step one is to talk with your doctor about your symptoms. 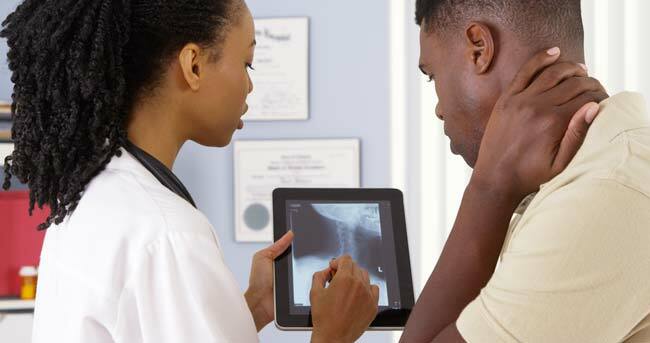 If you require treatment, Erlanger Orthopaedics offers specialized expertise in treating spine-related issues. Learn more or book an appointment with Dr. Venkat Ganapathy here.